Join us this Saturday afternoon for the finale of this term's Lunchtime Recitals at St Clement's. The St Clement's Players will be returning, again under the baton of Karol Jaworski. 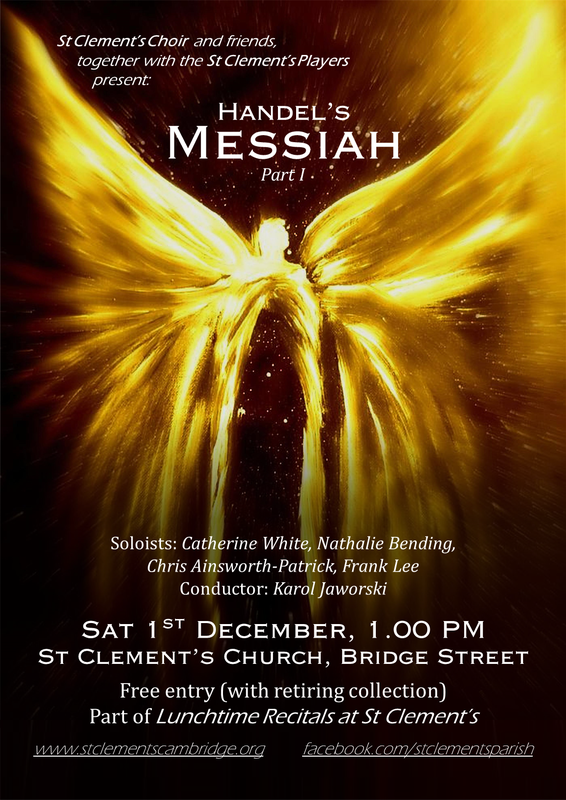 They will be joined by a number of choirs, including the Choir of St Clement's, The Wren Choir, The Orlando Singers, and The Erasmus Chamber Choir, in a performance of Part I of Handel's Messiah. With it's memorable choruses, arias, and powerful depictions of prophecy, angels appearing unto shepherds and the birth of Christ, it's a brilliant way to settle into the festive season on the eve of Advent. We do hope you are able to be there! The recital begins at 1.00pm, and as ever, entry to the recital series is free, with a retiring collection supporting our recital series, and also contributing to our Organ Redevelopment Fund. All are welcome.